One of my favorite things to do with Basic Seasoned Ground Beef is make pastelón; the Puerto Rican equivalent of Shepherd’s Pie. It doesn’t take a lot of active prep (although it does require oven time in addition to stove top time) and it is a warming dish that will take everyone to their happy place. Click here for Pastelón de Platanos – Plantain Pastelón – another classic version of this dish). The more beef you use, the thicker it will be. You can also substitute Pollo Guisado (stewed chicken). The first section is the yuca preparation, but I also include the beef and chicken recipes in this post so you have them handy. Reminder! Yuca can be bought peeled, chunked and frozen in most supermarkets (even if you don’t have a big Latin population in your neighborhood). In diverse neighborhoods you may find it fresh, but it is such a pain to peel that I rarely bother. You can always substitute potato, but you won’t get the chewy density that is part of yuca’s appeal. 1 pint-1 qt Basic Seasoned Ground Beef at room temp (see recipe below) or Pollo Guisado (Stewed Chicken) in the amount of the recipe below. Boil two quarts water (or enough to eventually cover the yuca) and add salt and lemon juice. Add yuca and return to boil. Cover and boil until very soft, about an hour. Don’t worry about it losing shape; you will be mashing the bejesus out of it. Meanwhile, preheat oven to 350°F. Take an 8×8 casserole/oven dish (must have sides!) and grease lightly with vegetable oil. Drain cooked yuca, and mash with a potato masher until most lumps are gone. As you mash, pull out the thick central fibers, which are inedible. Line the bottom of the dish with half the mashed yuca. Spread the ground beef mixture evenly over. Top the beef with the remaining yuca. It will be sticky, so do the best you can; dollops are fine if it won’t spread for you. Place in preheated oven, covered with aluminum foil, for 30 minutes. Remove foil (brush with butter if desired) and cook for an additional 10 minutes. Let stand for 10 minutes or so before serving. Hmmm, I searched high and low for the yuca at my grocery store and couldn’t find it. 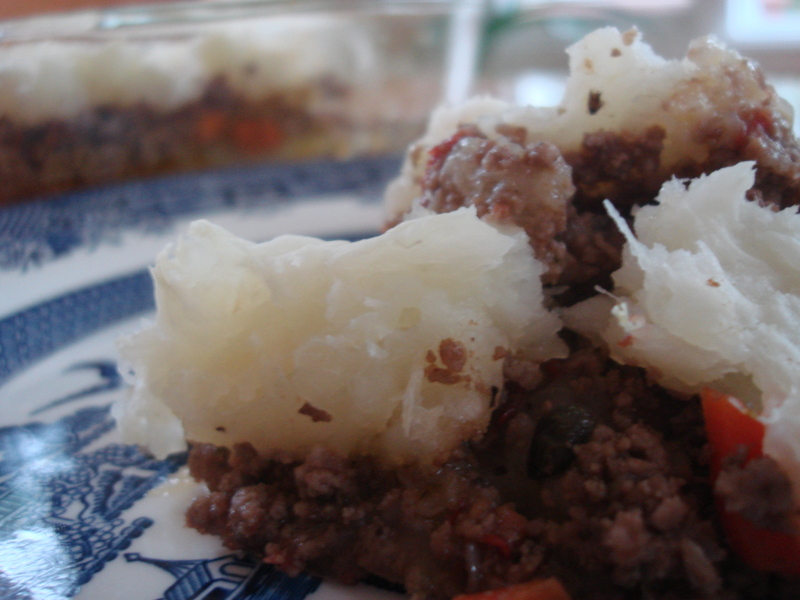 I will be trying the picadillo though as it looks yummy and I’ve got all the ingredients. Natalia, this sounds delicious. I will try it. You are right, with “Yuca Goya empaquetada”, which is so good, why bother peeling? Very cool twist. I love the olives and bring on the heat!